You will find fastening rings at the front and rear of the luggage compartment which can be used to secure luggage (arrow). Some fastening rings have to be folded out before they can be used. Unsuitable or damaged securing straps could rip in the event of a braking manoeuvre or accident. This could cause objects to be flung through the interior and lead to severe or fatal injuries. Attach securing straps securely to the fastening rings. 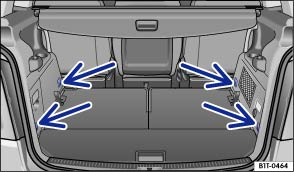 Loose objects in the luggage compartment can suddenly slide and change the way the vehicle handles. Small and light objects should also be secured. Never exceed the maximum load rating of the fastening rings when securing objects. Never secure a child seat to the fastening rings. The only exception to this is when a child seat is fastened with the top tether to the fastening rings bolted on at the side. The maximum load rating of the fastening rings is 3.5 kN (3.57 kp). Suitable fastening belts and luggage stowage systems are available from a qualified workshop. Volkswagen recommends using a Volkswagen dealership for this purpose.